New Ikenga Hotel and Resort presents an event whose top notch has never been witnessed in the green beautiful town of Nsukka in Enugu State. This occurrence promises as one to leave an evergreen imprint in the hearts of the people. 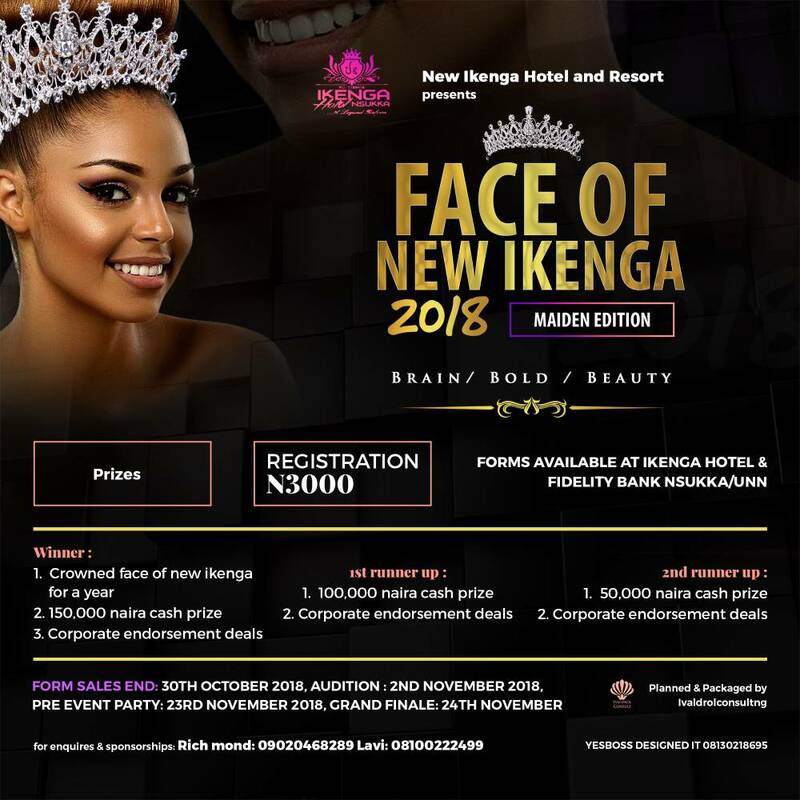 Face of New Ikenga 2018 ‘The maiden edition' comes packaged with dazzles of elegance. It is an event where beauty will cross paths with brains, intelligence, confidence, cultural heritage, style and class. Sales of forms for the prestigious paegent experience begins on the 30th of October, 2018. Preceded by auditions for the 2nd of November, 2018 and a heartwarming but mind blowing pre-event party which follows, on the 23rd of November, 2018. This event will be summarized with prizes for the winner of the pageantry, the first runner-up and the second runner-up. 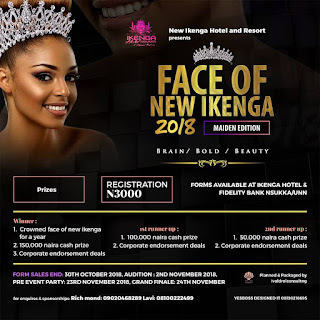 The winner gets crowned as The New Face of Ikenga for a year, He or she gets 150,000 naira and obtains a corporate endorsement deals. The first runner-up gets 100,000 naira cash prize and corporate endorsement deals too, while the 2nd runner-up receives 50,000 naira cash prize and corporate endorsement deals. Forms would be made available at Ikenga Hotels and Resort, Nsukka and also at Fidelity Bank Nsukka and UNN campus. The forms sells at 3,000 naira per head. Do you have what it takes? How well can you express your pageant talents?